The purpose of this study is to identify a suture technique that provides superior cosmetic outcomes and proper wound healing for skin closure after midline laparotomy of small animals in a rabbit model. This study also attempts to clarify the role of selected four suture patterns in wound healing, wound complications, cosmetic impacts and histopathology on the laparotomy skin wound. Twenty four female rabbits of white New Zealand and California breeds were used for this experimental study. Four suture patterns were compared for cutaneous closure of a 7–cm midline laparotomy wound, classified as; buried continuous subcuticular–intradermal (BCSID), interrupted cruciate mattress (ICM), running horizontal mattress (RHM), and far–near–near–far (FNNF). The different groups were studied in terms of clinical findings, wound and suture biometrics, cosmetic assessment, microscopic examination, and statistical analysis. RHM presented a 'very good' cosmetic grade on a 6-element scale, clinically associated with rapid successful wound healing, and no complications. BCSID was superior in cosmetic terms among the tested groups where it showed an aesthetically 'excellent' score. However, the technique was not efficient enough to prevent wound dehiscence in some cases. ICM demonstrated a 'very good' cosmetic degree but was not functional enough to prevent invasive contamination or infection in certain instances. FNNF was the inferior among all groups in regards to the cosmetic outcomes but was characterized by successful, slowly-progressive healing. Suture-to-wound length (SL: WL) ratio of all groups seemed to have a correlation with the rate of wound dehiscence as wound dehiscence is unlikely to occur if a SL: WL ratio is more than 4:1. The microscopic results proved that the RHM suture pattern was the favourable technique. RHM can be concluded as the suture technique of choice for cutaneous closure of laparotomy wounds in small animals like rabbits. It serves as a compromise of high-quality cosmesis and optimal wound healing. The assessed suture techniques can be graded in a descending order from the superior to the inferior cosmetically as BCSID>RHM>ICM>FNNF, and histopathologically as RHM>FNNF>BCSID>ICM. Clinical trials are needed to be performed to validate and reproduce the outcomes of this study on canine and feline patients. Laparotomy is a commonly performed surgical procedure in small animal practices and referral hospitals.1,2 Technical considerations when performing the operation include an appropriate patient preparation, surgical approach and wound closure.2 It is important to know whether the wound closure by continuous or interrupted suture techniques provide proper wound healing and lower complication rates, so as to allow veterinary surgeons to make an informed decision when choosing a pattern for an abdominal closure.2,3 Several suture techniques are routinely used for cutaneous closure of surgical wounds, specifically those implemented in laparotomy operations of small animals as dogs and cats.3–5 Surgeons and pet owners have various controversial attitudes on the subject of cosmetic surgery.6,7 However, the owners and breeders take special pride in their pet's appearance for dog/cat show competitions, and are deeply shocked by the poor cosmetic outcome of a given surgery, even if patient function and comfort have been restored or maintained.7 An ideal suture technique should provide accurate, quick and secure skin edge apposition for a sufficient length of time until complete healing occurs.8 Major wound complications include wound dehiscence, haemorrhage, infection, evisceration or herniation that may develop to worsen the final results.9–11 In non-complicated cutaneous wounds, an in-depth look shows that fibrotic scar deposited during skin wound healing can cause disfiguration and loss of dermal function.12 The need for rapid, aesthetic, and effective closure of the cutaneous wound has increased over recent years.9–13 Useful suture techniques improving cosmetic results include deep dermal sutures with buried knots, simple interrupted sutures, vertical mattress, horizontal mattress, subcuticular sutures, continuous over-and-over sutures and far–near–near–far pulley sutures.14 A variety of suture materials are also available to select appropriately for each wound.15 In the past, a general veterinary practice would have stocked only silk, catgut, nylon and perhaps stainless steel, but we now use a range of synthetic absorbable and non-absorbable sutures.16 The role of sutures in wound repair process is dedicated to provide haemostasis and adequate support for healing tissue. Wound healing is the reestablishment of tissue continuity that occurs through a complex process with well-orchestrated cellular and biochemical events activated at the time of injury.17,18 The process is conceptually divided into three continuous and overlapping phases; inflammation, proliferation, and maturation.18,19 There has been an assumption that wound healing is a relatively homogeneous process across species. We need to look into the presentation of wound healing in various veterinary and human surgical studies, and to the fact that almost all knowledge of cutaneous wound healing has been derived from studies on relatively few species as rodent, pig, dog, horse, and human.20 As the skin of rabbits resembles in a great extent to that of cats, an experimental study in rabbits gives pivotal results that can be more representative and mimic to those of cats.21 Many researchers in veterinary and human practice have investigated the healing of laparotomy skin wounds with regards to aesthetic impact.7,9,22 Previous studies on dogs,7 cats,11,13 rabbits,23 and rats24 have shown that the approach and design of suture technique exerts a clinical, biomechanical, physical, and histological influence on the quality of wound healing. This study aimed to compare between four suture techniques for skin closure of midline laparotomy incisions in order to achieve superior cosmetic results, effective wound closure, lowest postoperative complications, and optimal wound healing. 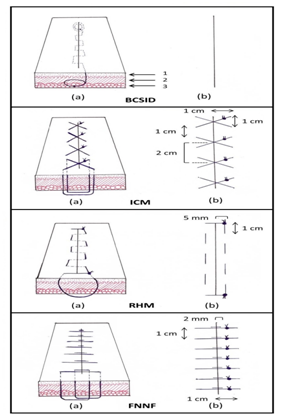 The four suture techniques involved buried continuous subcuticular–intradermal suture pattern (BCSID), interrupted cruciate mattress suture pattern (ICM), running horizontal mattress suture pattern (RHM), and far–near–near–far suture pattern (FNNF). The different suture patterns were assessed in terms of clinical, biometric, cosmetic and microscopic outcomes of the cutaneous wound healing in a rabbit model. Twenty four (24) clinically healthy female rabbits of white New Zealand and California breeds (8 NZ and 16 CA) whose age ranged between 63–132 days (Mean±SEM; 111±5.5days) with a body weight of 1055–2910gm (1965±97.4gm) were used for the study. Recommendations of the Guide to the Care and Use of Experimental Animals were followed to come up with the concepts of animal welfare and proper management.25 The rabbits were obtained from Poultry Farm of the Faculty of Agriculture, Assiut University (Assiut, Egypt), and clinically examined to ensure good health status and absence of any dermatological disorders. The study design was approved by the Board of Veterinary Surgery Department Council and Faculty of Veterinary Medicine Council with a sample size of 20–30 animals considering animal reduction principles. The animal sample size was determined in the current study by a power calculation from a previous study on cats that has used 24 animals.11 Randomization was assigned by two participants who were blinded to the study design. The animals were chosen randomly for ear identification using a permanent marker. Randomization was carried out via a paper lottery. The animals were divided into four groups, each with two subgroups. Each group involved six rabbits; and each subgroup included three rabbits. The four groups were classified according to the skin suturing pattern. The corresponding subgroups were subdivided based on the time sequence of histopathological samples’ collection on the 10th and 17th postoperative day (POD). Figure 1 Plate showing the operative technique of laparotomy in the rabbit. (A) Placement of towels and clamps. (B) Incision of the skin, with dissected subcutaneous tissue. (C) Incision of the linea alba before peritoneal penetration. (D) Exploration of abdominal viscera after peritoneal penetration. (E) Suturing of the abdominal muscles with four cruciate mattress sutures. (F) Suturing of the subcutaneous tissue. (G) Insertion of the needle in the dermis for placement of the initial buried suture in BCSID closure. (H) Burial of the end suture after apposition of the skin edges prior to cutting off the suture thread in BCSID closure. Non-absorbable multifilament 3–0 silk sutures (Silk®, Bekon, South Korea) in the ICM, RHM and FNNF groups. Figure 2 Schematic diagram illustrating the dimensions of each suture pattern in the skin. BCSID: buried continuous subcuticular intradermal, ICM: interrupted cruciate mattress, RHM: running horizontal mattress, FNNF: far–near–near–far, (1) epidermis, (2) dermis, (3) subcutis, (a) suture course, (b) external view. A long-acting oxytetracycline antibiotic (Alamycin LA®, 200 mg/ml, Norbrook, UK) was IM administered as a single dose following the surgery at the dose rate of 20mg/kg. A protective non-compressive abdominal bandage was applied for 6 days using sterile gauze and replaced after every wound examination post surgery. The rabbits were housed during the entire study period under the same conditions at the Experimental Animal House, Faculty of Human Medicine, Assiut University, Egypt. The animals were allowed free access to food and water ad libitum. A maintenance diet of both commercial feed pellets (Vinos®, Vinos Feed Service Co., Egypt) and fresh vegetables (carrot and parsley) were given in a natural light/dark cycle, with an ambient/warm room temperature. The skin wounds were followed up on postoperative days (PODs) 0, 2, 4, 6, 8, 10, 12, 14, 16 and 17 for clinical findings including; scab (inflammatory exudate), haemorrhage, hyperaemia, purulent exudate, dehiscence, and swelling. Presence of sinus, fistula or incisional hernia was also inspected. Parameters for clinical assessment of wound healing were summarized in Table 1 which constitutes a modified method after Pedrajas.26 The scab color was assessed through a colorimetric index of wound healing continuum.27 Wound dehiscence percentage was calculated by means of dividing the length of dehiscence on the entire wound length per cent.28 The surgery duration of skin closure was also recorded. Measurements of the wound length were taken on PODs 0, 5, 7, 10 and 17 for evaluation of wound contraction. The length of consumed suture in surgery was measured for calculation of the suture-to-wound length ratio (SL: WL) as described by Varshney et al.29 This calculation was carried out via a mathematical formula; consumed suture length (cSL)=preoperative suture length (pSL)–remained suture length (rSL). Then, the consumed suture length (cSL) was divided on the preoperative wound length (pWL). The scoring system used for cosmetic assessment of the healing wounds was the Stony Brook Scar Evaluation Scale (SBSES) with a slight modification after Rao et al.30 Two assessors performed the cosmetic assessment; of which one assessor was aware of the different groups (subjective assessment), and one assessor was blinded to the different groups (objective assessment). The parameters of the original SBSES included width, height and colour of the scar, presence of suture/hatch marks, and overall appearance on PODs 10 and 17. Hair development in the cutaneous wounds was evaluated as a new parameter to the modified scale (mSBSES) with 0 for absence and 1 for the presence of any hair on the incision line (Table 2). Repeated measures two-way analysis of variance (ANOVA) was performed to detect any overall differences between the suture techniques in terms of wound length (WL) that was measured over different time points. In this analysis, the suture technique and the time of wound healing (T) were set as fixed effects, whereas the subject (rabbits) was considered random effects. The one-way ANOVA test was used to find whether the suture techniques are statistically different in terms of suture lengths (SL) and suture-to-wound length (SL:WL) ratio. A follow up analysis was performed using Tuckey’s test for multiple comparison to find which pair of techniques are different using the 95% confidence intervals. To compare the suture techniques in cosmetic scores of mSBSES, Welch’s test was used instead of one way ANOVA. This test assumes unequal variances, which is practically better than assuming equal variances in normal ANOVA and it works well when the response variable takes a few numbers of numeric values. Differences between techniques were considered statistically significant when P<0.05. The data analyses were conducted using Minitab Statistical Package® (Version 18.1, Minitab Inc., developed at Pennsylvania State University, USA). All wounds of BCSID group showed marked hyperaemia of the skin around the incision on POD 0. The terminal ends of all wounds were slightly elevated over the initial and terminal knots. In 1 out of 6 incisions, the wound margins at the entire length were slightly elevated over the skin surface on POD 2. Sanguineous exudate was seen predominantly from POD 2 to 4. The scab sloughed off by POD 8. Two cases out of 6 (33.3%) showed partial dehiscence (WD=33.5%) at the caudal third of incisions, where these wounds eventually healed by second intention. Hair started to grow from POD 10 until it masked the whole incision line at POD 17 (Figure 3). In ICM group, the wound margins were slightly elevated over the skin surface in all animals (Figure 3). Serosanguineous exudate was found in medium quantities confined to the wound bed and partially soiled the protective dressing on POD 2, and the subsequent scab developed from PODs 2 to 10. In 3 cases (50%) on POD 6, there was an increase in the amount of exudates that could stretch the wound margins a bit to render a small filled gap between a couple of sutures. Of such cases, one revealed scant purulent exudate. From POD 12 to 17, the other wounds were seen with variable degrees of hair growth. All wounds of RHM group were slightly elevated on POD 0 (Figure 3). They gradually relieved and eventually flattened with the surrounding intact skin by POD 12. Every single wound did not show any haemorrhage or purulent discharge. Pink wound beds as well as serous scab were characteristic findings in this group from POD 2. Scab started to slough off from POD 6, and completely fell off by POD 10. Hair growth was not noticeable in 2 out of 3 cases (66.7%). Regarding hyperaemia, the skin colour in all wounds was normal except one which was mildly hyperaemic on POD 2 and returned normal on subsequent days. The skin edges in FNNF group were slightly inverted on POD 0 (Figure 3). Minimal dehiscence (WD=10%) occurred at the middle portion of incision in one case (16.7%) on POD 2 due to animal self-mutilation. No haemorrhage was observed in any day. Three cases (50%) were hyperaemic and showed marked allergic signs on POD 4 presented with rashes, denuded or erosive scaly skin in the surrounding area which recovered and appeared normal by POD 8. The suture marks of all wounds of the group left a characteristic railway-like appearance. No sinus, fistula nor incisional hernia developed in any of the four groups. The surgery duration of skin closure lasted for 44-56 (Mean±SEM; 49.5±2.0) minutes in BCSID group, 15–18 (17.2±0.5) minutes in ICM group, 16-19 (17.5±0.6) minutes in RHM group and 15–21 (18.2±0.9) minutes in FNNF group. Figure 3 Representative plates showing the gross changes of successful wound healing for each suture pattern on different postoperative days (PODs 0, 2, 4, 6, 8, 10, 12, 14, 16 and 17). BCSID: buried continuous subcuticular intradermal, ICM: interrupted cruciate mattress, RHM: running horizontal mattress, FNNF: far–near–near–far. Numbers positioned in the cranial direction of the incision are referring to the postoperative day. 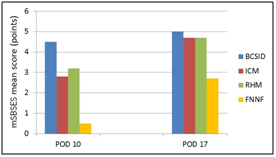 The wound lengths (WL) of BCSID group decreased from POD 0 to POD 5 then slightly increased on POD 7 and re-decreased successively from POD 10 to POD 17 (Table 3 & Figure 4). The WLs of ICM group decreased from POD 0 to POD 10. Afterwards, the lengths returned to be around the initial WL on POD 17. Measurements of the WLs for the RHM group decreased continuously from POD 0 to POD 10 and then increased again on POD 17. All WLs of FNNF group decreased gradually from POD 0 to POD 7, slightly increased on POD 10 and declined afterwards on POD 17. The measurements for preoperative suture lengths (pSL), remained suture lengths (rSL), consumed suture lengths (cSL), preoperative wound lengths (pWL) and suture-to-wound length ratios (SL: WL) for each group were recorded in Table 4. 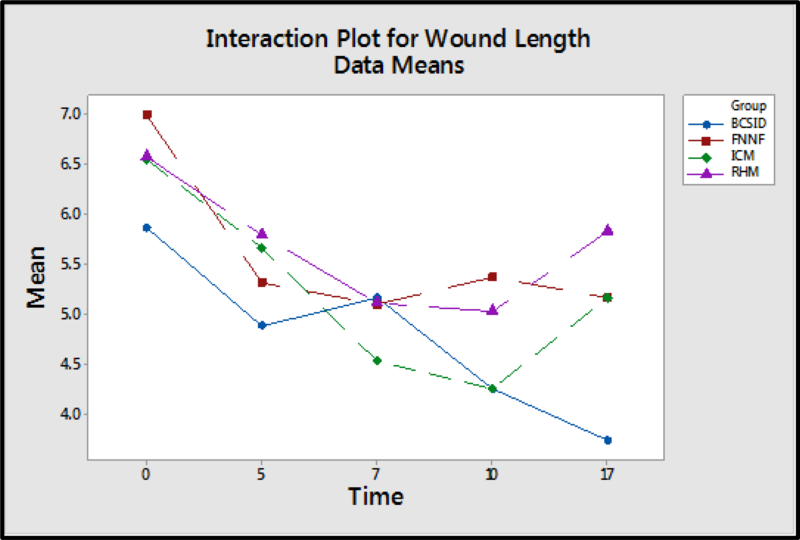 Figure 4 An interaction plot displaying a potential interaction between the suture techniques and the time of wound healing. It shows that the wound length averages of the techniques are different and the performance of the techniques changes over different postoperative days (PODs 0, 5, 7, 10 and 17). The wound scars of BCSID group on POD 10 had an aesthetic total score 4.5±0.7 out of 6 (where the number 6 is the optimum score of modified Stony Brook Scar Evaluation Scale). Such score of the BCSID group was graded as 'very good' as 75%. Later on POD 17, the score increased to 5.0±1.0 out of 6 (excellent, 83.3%) (Table 5 & Figure 5). The cosmetic outcome of the ICM group was initially 'poor' (mSBSES=2.8±0.9, 47.2%) on POD 10. Over time, it improved to became 'very good' (mSBSES=4.7±0.7, 77.8%) on POD 17. In RHM group, the resulted scars were 'satisfactory' with mSBSES score (3.2±0.5, 52.8%) on POD 10. Increasingly, the score had the same outcome of ICM (4.7±0.7, 77.8%) on POD 17. The FNNF group had a 'very poor' cosmetic outcome at the first time of evaluation (POD 10; mSBSES=0.5±0.3, 8.3%). On the 17th postoperative day, the aesthetic features of its scars improved but remained 'poor' looking and they did not reach a satisfactory level of cosmesis (mSBSES=2.7±0.9, 44.4%). Figure 5 Chart illustrating comparative results for the cosmetic outcomes of wound scars expressed by the mean scores of mSBSES for each suture pattern on PODs 10 and 17. Histopathological characteristics of the skin tissue closed by the BCSID suture pattern varied in both phases of wound healing on the 10th and 17th postoperative day. 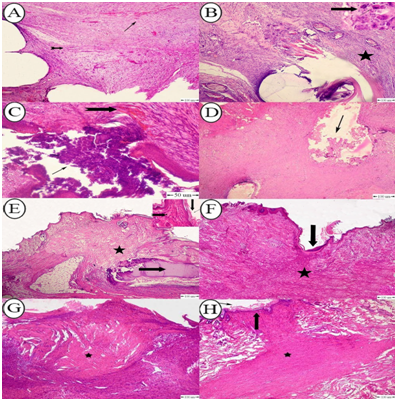 On POD 10, a detectable amount of immature connective tissue was observed at the deep layers of dermis along the wound incision; afterwards it developed on POD 17 as abundant mature collagen bundles infiltrated with chronic inflammatory cells. Pseudo-healing was observed in one incision and a moderate wound gap was shown between the wound margins with keratinization. Vascular changes expressed by varying degrees of neovascularization were seen in the dermis in one case on POD 10 with haemorrhage (Figure 6A). This reaction was replaced by connective tissue infiltration of the dermis and subcutaneous tissue with a moderate to high number of monocytes, lymphocytes and plasma cells and foreign body giant cells aggregated around the suture (Figure 6B). The wounds closed by the ICM suture pattern demonstrated two cases with inverted wounds. Suppurative inflammation occurred in one of the two inverted wounds. The number of acute inflammatory cells increased in such case on POD 10 leading to pus formation at the epidermal surface and was associated with mild haemorrhage within the dermis (Figure 6C). A mild degree of chronic inflammatory cellular reaction was also observed in all wounds on POD 10 which disappeared later on POD 17. Formation of granulation tissue began to develop at the base of the wounds but the amount was scant and remained constant in both phases of the histopathological changes at the 10th and 17th day post wounding (Figure 6D). On day 10 post-surgery with RHM suture pattern, the epidermal cells began to cross over the injury and underwent partial reepithelialization. The dermis was composed primarily of unorganized dense connective tissue with thick irregular collagenous fibers with infiltration of acute inflammatory cells around the wound edges where scab was also developed on the surface to effectively seal the wound and further collapse (Figure 6E). By day 17, the wounds distinctly demonstrated complete healing as the granulation tissue fully filled the wound gap, and this was accompanied by complete reepithelialization with hyperkeratosis (Figure 6F). The wound gap on POD 10 with FNNF suture pattern showed partial healing. The granulation tissue formation was adequate to fill the entire wound space while the reepithelialization was absent (Figure 6G). On day 17, no change was detected in the amount of granulation tissue but reepithelialization was completely developed (Figure 6H). The comprehensive histopathological scores among all groups at both stages of assessment on PODs 10 and 17 were tabulated and shown in a comparative chart (Table 6). Figure 6 (A) Photomicrograph of rabbit skin with BCSID suture pattern on POD 17 showing mature connective tissue infiltrated with mild hemorrhage (arrow) and neovascularization (notched arrow); (B) Photomicrograph of rabbit skin with BCSID suture pattern on POD 10 showing connective tissue infiltrated with chronic inflammatory cells around the suture tract (star), presence of multinucleated giant cells around the suture material (arrow); (C) Photomicrograph of rabbit skin with ICM suture pattern on POD 17 showing pus formation (arrow), and mild hemorrhage in the dermis (notched arrow); (D) Photomicrograph of rabbit skin with ICM suture pattern on POD 10 showing beginning of granulation tissue formation at the base of the wound (arrow); (E) Photomicrograph of rabbit skin with RHM suture pattern on POD 10 showing immature connective tissue (star) with infiltration of acute inflammatory cells around the wound edges (notched arrow) and the epidermis underwent hyperkeratosis (down arrow) with scab formation (right arrow); (F) Photomicrograph of rabbit skin with RHM suture pattern on POD 17 showing complete healing of wound gap with complete reepithelialization (arrow), and granulation tissue formation (star); (G) Photomicrograph of rabbit skin with FNNF suture pattern on POD 10 showing complete healing with granulation tissue formation (star); (H) Photomicrograph of rabbit skin with FNNF suture pattern on POD 17 showing complete granulation tissue formation filling the entire wound gap with mature fibroblast cells (star) and reepithelialization (arrow). H&E stain. Bar=100μm. One-way ANOVA test showed that the four suture techniques are not the same in suturing time (surgery duration), where P<0.05. From Tuckey’s test, it is found that the first technique (BCSID) is different from the other three techniques, FNNF, ICM, RHM, at 5% significance level. BCSID has the highest average time among the four techniques. Also, Tuckey’s test revealed that there is no significant difference between the other three methods (FNNF, ICM, RHM) and they are the same in terms of the surgery duration at 5% significance level. The assumptions of ANOVA test are checked and found that they are met. Figure 4 displays a potential interaction between the suture techniques and the time of wound healing where the wound length averages of the techniques are different, and the performance of the techniques is different over time. As a result, this interaction is included into the two-way ANOVA with repeated measures analysis which showed that the suture techniques are not the same in WL (P<0.05). It is found that BCSID and ICM have smaller average WL compared to FNNF and RHM. It is also found that there is a significance difference in suture lengths (SL), and suture-to-wound length (SL: WL) ratios (P<0.05) between different techniques. From the analysis and Tuckey results, all suture methods are different from each other. The order of these methods from least to greatest in the mean value is FNNF, ICM, RHM, and BCSID. Welch’s test results showed that cosmetic scores of mSBSES scale are significantly different between for the different methods on POD 10, where P-value is less than 0.05. Nevertheless, on POD 17, there is no significant difference (P>0.05) between the four methods. In the present study, the suture-to-wound length ratio in BCSID, ICM, RHM and FNNF groups was 2.1:1, 3.6:1, 2.4:1 and 5.5:1 respectively. These results appear to correlate with the incidence of wound dehiscence. It was proven in previous studies that a SL: WL ratio more than 4:1 for laparotomy closure could reduce WD.59 However, dehiscence did not occur with RHM group of which the ratio was 2.4:1. This may be attributed to the suture material implanted in the full thickness of the skin with an equal tension applied on the wound edges that led to abundance in the remained suture and shortage in the consumed suture. Cosmetic assessments in the current study revealed that the BCSID suture pattern was the superior technique among all groups as it provided the highly cosmetic appearance of wounds on both PODs 10 and 17. Nevertheless, they showed more aesthetic outcomes on the 17th day with the highest mSBSES score. This was consistent with Sylvestre et al.9 who concluded that the buried continuous subcuticular suture pattern may influence a better cosmetic appearance on a cutaneous closure of canine ovariohysterectomy at the time of recheck visit. If in cosmetic order, the second cosmetic rank was for RHM, and the third was for ICM, while FNNF technique came at the last as it gave worst cosmetic results. In plastic surgery, the Patient and Observer Scar Assessment Scale (POSAS), and Vancouver Scar Scale are widely used for scar assessment in human patients, but it is difficult to decide which scale can be used typically for each scar condition and treatment method. The assessment of newly developed surgical scars was most commonly performed by the POSAS.60 Since the patient is involved in the POSAS assessment; this scale cannot be applied to those speechless creatures, the rabbits, but perhaps via the sponsorship of the animal owner. Clinical scar assessment lacks a standardized methodology and a systematic approach. Therefore, studies continue to lack consensus regarding the most appropriate and applicable evaluation instrument. Fearmonti et al.61 discussed the quantitative and qualitative measurement modalities that are needed to evaluate and monitor scars. They provided a review on available clinical tools and current assessment scales used to subjectively and objectively characterize scars. The authors emphasized that an optimal, universal scar scoring system is necessary to be constructed in order to better characterize, understand and treat pathologic scarring. The Stony Brook Scar Evaluation Scale (SBSES) was proposed by Singer et al.62 and its reliability was acceptable. It is a 5-element ordinal wound evaluation scale developed to measure short-term cosmetic outcome of wounds in 5 to 10 days after injury up to the time of suture removal. This scale incorporates assessments of individual attributes with a binary response (1 or 0) for each, as well as overall appearance, to yield a score ranging from 0 (worst) to 5 (best). The SBSES has only recently been suggested for use in research, as it was designed to measure short-term rather than long-term wound outcomes.61 In the current study, we innovated a new parameter added to our modified 6-element SBSES with 0 for absence and 1 for presence of any hair development on the incision line. The novel parameter acted as an indicator for optimal cutaneous healing in the rabbit where the skin retains its physiological functions with developing hair follicles and its adnexa. The mSBSES cosmetic scores in the current study were consistent with the clinical and microscopic outcomes. The degree of cosmesis in case of RHM group was low and undesirable on POD 10 due to the presence of suture marks at that time. By day 17, the technique gave an enhanced outcome of cosmesis as these marks faded away over time. These results were in accordance to Moody et al.40 who stated that RHM provides good wound eversion, reduce wound tension, and promote haemostasis. It also has a less constrictive effect because the wound edge pressure is applied only unilaterally which is evenly distributed across the entire wound line. Moreover, RHM is a continuous pattern, thus limiting the stress on the wound edges. A punctate scar (i.e. suture holes) was seen in FNNF group. Dunn58 explained that this occurs when the skin sutures are not placed with excessive tension and are removed at an early time. The forces that create either crosshatching or suture marks will remain after suture removal. Histopathological findings of the present study were consistent with such explanations where the FNNF group showed notable great amounts of mature collagen fibers. This result was in agreement with Yang et al.63 who stated that the main histological components of the skin scar are thick epidermis and dermis with tough collagenous fibers. Microscopic examination of BCSID group revealed formation of an epidermal bridge (stratum corneum) over the incision while the dermis did not develop and presented with a moderate gap. However, the wound appeared normally healed by the naked eye at the same time. Unexpected adverse results can occasionally occur in cats. Of these, Bohling33 reported such condition and called the phenomenon 'pseudo-healing'. The sutured skin incision might seem like normally healed at the time of suture removal but after that time, when the animal exerts a normal physiological stress on the closure, such as a cat jumps up from a chair, complete dehiscence occurs. In contrast, integral skin closure was evident in the RHM group on day 10, with partial reepithelialization and scab formation. By day 17, the wounds notably showed complete healing as the granulation tissue entirely filled the wound gap with complete reepithelialization and hyperkeratosis. Cotran et al. highlighted that the quantitative increase in collagen ends in 10 days and the wound is moderately healed at this time. By 14 to 16days, normal wound healing in the rabbit is complete; this was harmonic with Gourley and Gregory.64 Likewise, such changes occurred in FNNF group, but reepithelialization was absent on day 10. However, the wounds afterwards underwent complete reepithelialization by day 17. In our study, the overall histopathological findings confirmed that the RHM suture technique was superior to other groups in terms of the wound healing scoring system of Kiani et al.13 The RHM was associated with successful wound healing on both phases of evaluation on day 10 and 17. The dermal tissues showed acute followed by chronic inflammation, complete reepithelialization, full maturation of fibroblasts, and abundant formation of collagen bundles at the end of the study on the 17th postoperative day. Potential limitation of the present study might lay in the differences in the type of suture material used in BCSID group (PDX) and the other three groups (Silk). It was presumed that BCSID could provide favourable outcomes in all terms of the assessment on the account of other tested techniques. However, the overall study outcomes showed unexpected results supporting for RHM. Short-term wound monitoring may impose a restriction for expecting later cosmetic impacts, as a longer time would be required for wound examination so as to ascertain no further downsides might develop. The lack of standardized modalities of scar assessment scales, and the subjective/objective nature of these scales might have a different response to the parameters upon clinical trials. Reliability of cosmetic scores is context and content specific, and further testing required to translate them in a heterogeneous setting (different models, raters, and techniques). Future studies also need to be conducted to implement an equal approach for the aesthetic suture patterns using a uniform material and a standardized scale, hence to validate the appropriate use of these suture techniques in clinical practice. Interrupted cruciate mattress suture technique. The study was self-funded by the first author, and received no specific grants from public funding bodies or research institutions. Authors express many thanks to Mr. Samy ElAriny and Mrs. Huda Fares (Donators, Animal Welfare Society, Assiut, Egypt) for their generous financial contributions. The partner donators had no role in the design of the study or collection, analysis, and interpretation of data or in writing the manuscript. Acknowledgements extend to Ms. Jennifer Giannoccaro (Instructor, Department of English Language, American Institute for Training and Education, Assiut, Egypt) for proofreading of the research article. Bellenger C. Abdominal wall. In: Slatter DH, Editor. Textbook of Small Animal Surgery. 2003:405–413. Boothe HW. Exploratory celiotomy. In: Bojrab MJ, et al, Editors. Current Techniques in Small Animal Surgery. 5th edition. 2014:246–250. Roberts C. Choice of suture pattern for linea alba closure. Vet Evid. 2017;2(3):1–11. Rosin E. Closure of abdominal incisions. In: Bojrab MJ, et al, Editors. Current Techniques in Small Animal Surgery. 5th edition. 2014;361–364. Johnson‒Delaney CA. Abdominal surgery of pet rabbits. In: Bojrab MJ, et al, Editors. Current Techniques in Small Animal Surgery. 5th edition. 2014;700–713. Neumann S. Cosmetic surgery: customer service or professional misconduct. Can Vet J. 2008;49(5):501–504. Pavletic MM. Atlas of Small Animal Wound Management and Reconstructive Surgery. 3rd edition. 2010:1–680. Perret‒Gentil MI. Principles of Veterinary Suturing. Scribd. 2017:1–25. Sylvestre A, Wilson J, Hare J. A comparison of 2 different suture patterns for skin closure of canine ovariohysterectomy. Can Vet J. 2002;43(9):699–702. Murthy VC, Murthy CNA, Jamuna KV, et al. Comparison of different laparotomy techniques of ovariohysterectomy and postsurgical complications in dogs. Indian J Can Pract. 2012;4(2):116–118. Kiani FA, Kachiwal AB, Shah MG, et al. Comparative study on midline and flank approaches for ovariohystrectomy in cats. J Agric Food Technol. 2014;4(2):21–31. Rhett JM, Ghatnekar GS, Palatinus JA, et al. Novel therapies for scar reduction and regenerative healing of skin wounds. Trends Biotechnol. 2008;26(4):173–180. Kiani FA, Kachiwal AB, Shah MG, et al. Histological characterization of wound healing of flank verses midline ovariohysterectomy in different age groups of cats. J Clin Pathol Forensic Med. 2014;5(2):6–16. Wu T. Plastic surgery made easy: Simple techniques for closing skin defects and improving cosmetic results. Aust Fam Physician. 2006;35(7):492–496. Kladakis S. Choosing sutures in small animal surgery. J Dairy Vet Anim Res. 2014;1(3):68–71. Neath PJ. Choosing the right suture material. Proceedings of the 47th Annual British Small Animal Veterinary Association Congress. 2004;389–391. Velnar T, Bailey T, Smrkolj V. The wound healing process: an overview of the cellular and molecular mechanisms. J Int Med Res. 2009;37(5):1528–1542. Souza CHM, Mann FA. Basic wound healing and wound closure. In: Mann FA, et al, Editors. Fundamentals of Small Animal Surgery. 2011:176–186. Witte MB, Barbul A. General principles of wound healing. Surg Clin North Am. 1997;77(3):509–523. Bohling MW, Henderson RA, Swaim SF, et al. Cutaneous wound healing in the cat: a macroscopic description and comparison with cutaneous wound healing in the dog. Vet Surg. 2004;33(6):579–587. Panakova L, Szalai K. Surface, barrier, and interface zone: comparative aspects of the skin. In: Jensen‒Jarolim E. Comparative Medicine: Anatomy and Physiology. 2014:103–117. Abubakar AA, Adeyanju JB, Kene ROC, et al. Comparison of three suture techniques in closure of caprine skin incision: cosmetic and cost considerations. Sci J Vet Adv. 2012;1(5):127–131. Jawad MM, Alam MK, AbdulQader ST, et al. Histological evaluation of incision healing response made by metallic scalpel on rabbits skin: preliminary study. Int Med J. 2013;20(4):496–498. Höer J, Klinge U, Schachtrupp A, et al. Influence of suture technique on laparotomy wound healing: an experimental study in the rat. Langenbecks Arch Surg. 2001;386(3):218–223. Olfert ED, Cross BM, McWilliam AA. Guide to the Care and Use of Experimental Animals. Volume 1, 2nd edition. Canadian Council on Animal Care. 1993;1‒193. Pedrajas AG. Comparison of the effects of a modified continuous intradermal closure and simple interrupted pattern on healing of experimental ventral abdominal skin incisions in cats. Undergraduate Thesis. Laguna: University of the Philippines Los Banos College of Veterinary Medicine; 2002. Gray D, White R, Cooper P, et al. Applied wound management and using the wound healing continuum in practice. Wound Essentials. 2010;5:131–139. Hohenleutner U, Egner N, Hohenleutner S, et al. 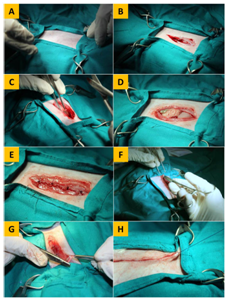 Intradermal buried vertical mattress suture as sole skin closure: evaluation of 149 cases. Acta Derm Venereol. 2000;80(5):344–347. Varshney S, Manek P, Johnson CD. Six‒fold suture: wound length ratio for abdominal closure. Ann R Coll Surg Engl. 1999;81(5):333–336. Rao VV, D’Souza C, Kumar S, et al. Comparative study of thyroidectomy wound closure using tissue glue versus subcuticular suture. Thyroid Res Pract. 2016;13(3):115–118. Bancroft D, Stevens A, Turmer R. Theory and Practice of Histological Technique. 4th Edition. Churchill Living Stone. 1996:47–67. Israelsson LA, Jonsson T, Knutsson A. Suture technique and wound healing in midline laparotomy incisions. Eur J Surg. 1996;162(8):605–609. Bohling MW. Wound healing. In: Langley‒Hobbs SJ, et al. Editors. Feline Soft Tissue and General Surgery. 2014:105–116. Smeak DD. Abdominal closure problems: From suture to technique. Veterinary Proceedings of the North American Veterinary Community and the American Animal Hospital Association. Ghag GS, Shukla KS, Karanjkar A, et al. A comparative study of stapled vs subcuticular vs simple interrupted closure of inguinal hernia incision. IOSR J Dent Med Sci. 2016;15(9):97–105. Gurusamy KS, Toon CD, Allen VB, et al. Continuous versus interrupted skin sutures for non‒obstetric surgery. Cochrane Database Syst Rev. Goto S, Hida K, Furukawa TA, et al. Subcuticular sutures for skin closure in non‒obstetric surgery (Protocol). Cochrane Database Syst Rev. Chupeco JP, Flores ML, Reyes MF. Macroscopic and microscopic changes in the wound after intradermal closure using buried knot and pulley knot‒free patterns following ovariectomy in cats. Philippine J Vet Anim Sci. 2013;39(2):277–286. Islam MA, Juyena NS, Ferdousy RN, et al. Effects of different suture patterns and materials on healing of incised skin wounds in cattle. Bangla Vet. 2014;31(1)27–37. Moody BR, McCarthy JE, Linder J, et al. Enhanced cosmetic outcome with running horizontal mattress sutures. Dermatol Surg. 2005;31(10):1313–1316. Turner AS, McIlwraith CW. Suture patterns. In: Techniques in Large Animal Surgery. 1982:81–93. Adams B, Jamshaid AM, David A, et al. Techniques for cutaneous sutured closures: variants and indications. Semin Cutan Med Surg. 2003;22(4):306‒316. Agrawal CS, Tiwari P, Mishra S, et al. Interrupted abdominal closure prevents burst: randomized controlled trial comparing interrupted‒x and conventional continuous closures in surgical and gynecological patients. Indian J Surg. 2014;76(4):270–276. Murtaza B, Khan NA, Sharif MA, et al. Modified midline abdominal wound closure technique in complicated/high risk laparotomies. J Coll Physicians Surg Pak. 2010;20(1):37–41. Flecknell P. Developments in the veterinary care of rabbits and rodents. In Pract. 1998;20:286–295. Cotran RS, Kumar V, Collin's T. Tissue repair, cellular growth, fibrosis and wound healing. In: Robin's Pathological Basis of Disease. 6th Edition. 1999:22–118. Field EJ, Hebert S, Friend EJ, et al. A survey of current practices and influences on the choice of suture material, pattern and size used in commonly performed procedures in UK small animal veterinary practice. Vet Rec Open. 2017. Bellenger CR, Meek MA. The use of sutures in Australian veterinary practices. Aust Vet J. 1990;67(3):81–86. Gaber M, Abdel‒Wahed R. Suture Coding: A novel educational guide for suture patterns. J Surg Educ. 2015;72(5):995–1004. Harari J. Wound healing. In: Small Animal Surgery Secrets. Philadelphia: Hanley & Belfus. 2004:1–6. Sohn J, Couto MA. Anatomy, physiology, and behaviour. In: Suckow MA, et al. Editors. The Laboratory Rabbit, Guinea Pig, Hamster, and Other Rodents. 2012:195–215. Bohling MW, Henderson RA, Swaim SF, et al. Comparison of the role of the subcutaneous tissues in cutaneous wound healing in the dog and cat. Vet Surg. 2006;35(1):3–14. Fried NM, Walsh JT. Laser skin welding: in vivo tensile strength and wound healing results. Lasers Surg Med. 2000;27(1):55–65. Chen X, Hou D, Tang X, et al. Quantitative physical and handling characteristics of novel antibacterial braided silk suture materials. J Mech Behav Biomed Mater. 2015;50:160–170. Homvises B. A randomized trial between different suture materials (polydioxanone vs. poliglecaprone 25) and different suturing techniques (running subcuticular suture alone vs. with running horizontal mattress) in prevention of hypertrophic scar development in median sternotomy wound. J Med Assoc Thai. 2014;97(8):88‒94. Fossum TW. Surgery of the integumentary system. In: Small Animal Surgery. 3rd Edition. 2007:159–259. Williams J. Decision‒making in wound closure. In: Williams J, Moores A, editors. BSAVA Manual of Canine and Feline Wound Management and Reconstruction. 2nd Edition. 2009:25–36. Dunn DL. Wound Closure Manual. Ethicon. 2012:1‒35. Millbourn D, Cengiz Y, Israelsson LA. Effect of stitch length on wound complications after closure of midline incisions: a randomized controlled trial. Arch Surg. 2009;144(11):1056–1059. Bae SH, Bae YC. Analysis of frequency of use of different scar assessment scales based on the scar condition and treatment method. Arch Plast Surg. 2014;41(2):111–115. Fearmonti R, Bond J, Erdmann D, et al. A review of scar scales and scar measuring devices. 2010;10:354‒363. Singer AJ, Arora B, Dagum A, et al. Development and validation of a novel scar evaluation scale. Plast Reconstr Surg. 2007;120(7):1892–1897. Yang SW, Geng ZJ, Ma K, et al. Comparison of the histological morphology between normal skin and scar tissue. J Huazhong Univ Sci Technol Med Sci. 2016;36(2):265‒269. Gourley IM, Gregory CR. Atlas of Small Animal Surgery. Gower Medical Publishing. 1992. © 2019 AbdelKhalek et al. This is an open access article distributed under the terms of the Creative Commons Attribution License , which permits unrestricted use, distribution, and build upon your work non-commercially.